SUNSCREEN IS A DAILY MUST TO REDUCE THE RISKS OF SKIN AGING, SKIN CANCER AND OTHER HARMFUL EFFECTS OF THE SUN. This Full Spectrum UVA and UVB Protection gives you confidence especially after long exposure to the sun. 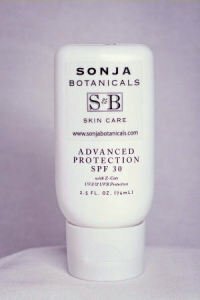 This advanced SPF 30 is light enough for oily skin. Zinc Oxide 7% (Z-Cote), is a transparent micro fine ingredient that physically blocks because it does not absorb so it does not cause any allergic reactions. The Professional Recognition of Z-Cote is well recognized by the dermatological community. Vitamins A and E are added to help skin elasticity and normalize dry parched skin; Extracts of the powerful anti-oxidant Japanese Green Tea known for its anti-irritant properties; Gingko Biloba, Ginseng and Licorice are added to revitalize and condition sluggish skin. Highly recommended for clients using Alpha Hydroxy Acids, and Retinol products and is a must for clients after laser treatments and chemical peels.